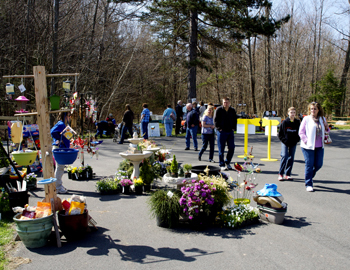 Enhance your home inside and out at the FREE weekend-long Wayne County Builders Association (WCBA) Home and Garden Festival on Saturday, April 26 from 9 am – 5 pm and Sunday, April 27 from 9 am – 2 pm, at Ladore Lodge Camp Retreat & Conference Center, in Waymart. Admission into the festival is compliments of Wayne Bank. There will be fun for the whole family, and many new offerings you won’t want to miss at the incredible indoor and outdoor event—supported by Bold Gold Media Group and Eastern Propane. In addition to top quality items and services for your home—like the latest in cabinetry, landscaping, gardening, appliances, home décor, windows, doors, and more—this year’s festival will feature our new Arts & Crafts Tent Village with other 30 vendors and an array of food at the many food tent stations. On both Saturday and Sunday at the festival is an opportunity to lighten your load at the Electronic Recycling Drop-off, so bring your old electronics—like TVs, stereos and computers. There’s no fee, but donations are welcome and will benefit the WCBA. Once you drop off your recycling you can replace the old with new items at the Silent Auction held throughout Saturday and Sunday. This year you will not want to miss the opportunity to see the uncovering of the Spectacular Outdoor Living Raffle package. Dozens of outdoor living essentials from patio furniture, gas grill, outdoor power tools, a fire pit, gift certificates, lanterns, planters, a hammock and much, much more. Raffle tickets will be on sale during the Festival for only $5.00 a chance. 100% of the proceeds of the Spectacular Outdoor Living Raffle will benefit the Shriners Hospitals for Children program. Saturday will also include a Flower Pot Contest at 11 am with free prizes, sponsored by Honesdale National Bank. To enter, be sure to listen to DNH 95.3 and Classic Hits 105.3 throughout the month of April. Ladore Lodge Camp Retreat & Conference Center is located at 287 Owego Turnpike, Waymart. For direct access use the Owego Turnpike entrance. For more information about the WCBA Home and Garden Festival visit WayneCountyBuilders.com or call 570-226-4941.